The history of the American shipyard Magnum can be divided into two precise periods, the first from 1966 to 1976, during which the shipyard won fame for its performance hulls especially in offshore racing, the second from 1976 on, when the shipyard became the property of Filippo Theodoli and his wife Katrin. 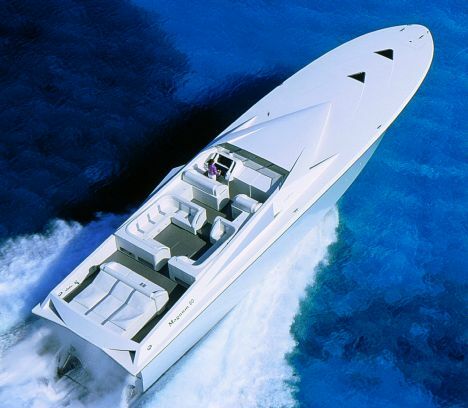 In 1976 Magnum Marine entered a new era, applying its experience gained in the sports sector to its luxury leisure yachts which it still produces with success. The models available include Magnum 80', an elegant yacht with a comfortable interior yet also able to achieve high performance at a speed of 45 knots with two 1,800 HP MTU engines and two Arneson surface propellers; with different motorization it can reach about 60 knots. The design of the Magnum 80' is the work by Pininfarina and is based on an assertive layout, characterised by original design elements which give this yacht a strong personality. The interiors comprise a spacious owner's cabin at the bow with walk-in wardrobe and bathroom, a double cabin with twin beds on the port side forward of the central area with private bathroom, dining area starboard with wide cabin at the bow, lounge, crew's cabin with private bathroom and double cabin astern, also with private bathroom. Outside the space has been divided into a spacious sundeck astern, outdoor lounge with double semi- circular sofa in the central area of the cockpit, bridge to starboard and seat on the port side. This is a yacht for speed-lovers who desire comfortable, elegant surroundings at the same time, featuring the kind of exclusive design that makes Magnum 80' stand out. For further information please contact Magnum Marine; 2900 North East 188th Street; - Florida; North Miami Beach (US); tel. 001 305 9314292; fax 001 305 - 9310088; web-site www.magnummarine.com. Fuel tank capacity: 5,680 lit. Engine: 2x1.800 HP or 2x3.650 HP MTU.